Paraguay will travel to Europe for a possible friendly with Ukraine on 3rd September followed by a match on the 7th against UAE (United Arab Emirates) in Villach, Austria. The game against Ukraine was scheduled to be in Kiev but due to the Paraguayan FA concerns current political crisis the venue is expected to be moved or the game will be cancelled. It seems Paraguay simply can’t organize a friendly (in 2012 they ended up playing Guatemala four times for lack of other opponents!). While the squad has a very “fresh” look with plenty of youngsters involved the major talking points are over three of the more experienced players. Roque Santa Cruz will win his 100th cap against Ukraine and this could be the perfect time to bow out, although he remains one of Paraguay’s best strikers in terms of recent international form. Nestor Ortigoza has been recalled for the first time since the 2011 Copa América final having been frozen out by Gerardo Martino’s successors. Finally, the fantastic central defender Pablo Aguilar is back, he was only left out of recent games because of an illogical medical report that claimed his low platelet count was a health risk. Winning the league with Xolos (who were fully aware of his genetic condition) and his subsequent splendid start with Club América in Mexico seems to have made the APF medical staff finally come to their senses. In terms of the domestic-based players there are call ups for Joel Silva who has been playing well for table-topping Guaraní while Oscar Romero is a shoe-in being the best young player in the country at the moment. Nacional’s run to the Copa Libertadores final has rewarded midfielder Silvio Torales and defenders Ramón Coronel and Leonardo Cáceres with call-ups. 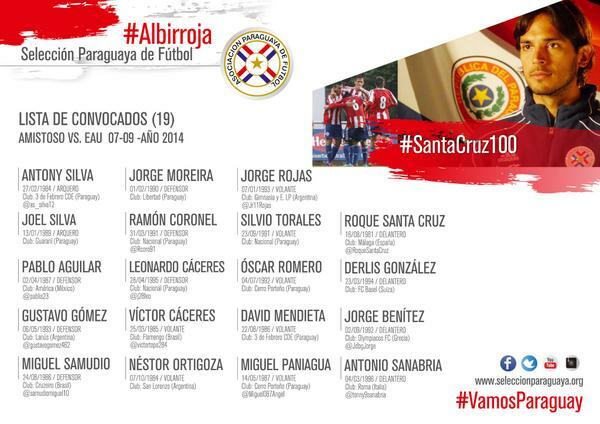 This entry was posted in National Team and tagged Paraguay squad for FIFA friendlies, Paraguay UAE friendly, Paraguay Ukraine friendly, Roque Santa Cruz 100th cap. Bookmark the permalink.